Best Clash Royale Decks for Trophy Pushing! 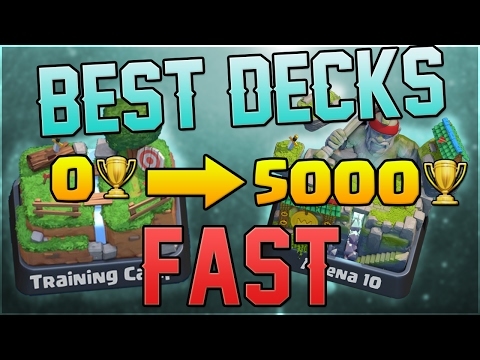 Want to know what the best decks are for getting trophies fast? Today I’m going to share three of the best decks you can use to gain trophies fast. These decks have proven to work. As an avid deck builder, I always keep an eye of the best decks in the game, not only by top players, but also by lower level players. I’m usually more interested in seeing a lower level player, for example, a level 11 player make it to 5000 trophies with low level cards because that’s not easy to do and it also shows you just how good that deck is for lower level players. Most players don’t have high level Legendary and Epic cards because they’re hard to level up. So check out the best decks in Clash Royale right now for trophy pushing!